In 1061, Our Lady appeared to Richeldis de Faverches, a Catholic English noblewoman in the village of Walsingham in Norfolk, England. Our Lady of Walsingham presented her with the plans of the Holy House of the Holy Family in Nazareth and asked that she build the house as a shrine and place of pilgrimage. The chapel was founded by Richeldis, the mother of Geoffrey of Favraches as confirmed by the earliest deeds. According to the text of the Pynson Ballad (c 1485), Richeldis de Faverches prayed that she might perform special deed as a gift to honor Our Lady. The Virgin Mary answered her prayer and led her in spirit to Nazareth, showing her the location where the Annunciation had occurred. Our Lady requested that a a replica house be built in Walsingham to serve as a memory of the Annunciation for all time. This Holy House was built and a religious community took charge of the foundation. With papal approval, the Augustinian Canons built a Priory (c 1150). .
Geoffrey son of Richeldis gifted 'to God and St. Mary and to Edwy his clerk the chapel of our Lady' with the intention that Edwy should found a priory. These gifts were, shortly afterwards, confirmed to the Austin Canons of Walsingham by Robert de Brucurt and Roger, earl of Clare. Our Lady of Walsingham had not only become one of the great pilgrimage sites of England along with Canterbury and Glastonbury, and but also in all of Europe as it became third most popular site behind Rome and Compostella, Spain. The suppression of the devotion to Our Lady of Walsingham began as evidenced by the writing of Protestant bishop Latimer wrote of the image of Mary saying that "She hath been the Devil's instrument, I fear, to bring many to eternal fire; now she herself with her older sister of Walsingham, her younger sister of Ipswich, and their two sisters of Doncaster and Penrhys will make a jolly muster in Smithfield. They would not be all day in burning". The Reformation caused the Priory property to be handed over to the King’s Commissioners and the statue of Our Lady of Walsingham was taken to London and burnt. The original shrine has no remnants, but its site features the marker noting “The Abbey Grounds” in the village. King Henry VIII approved the burning of the image of Our Lady of Walsingham: "It was the month of July, the images of Our Lady of Walsingham and Ipswich were brought up to London with all the jewels that hung around them, at the King's commandment, and divers other images, both in England and Wales, that were used for common pilgrimage...and they were burnt at Chelsea by my Lord Privy Seal". After the destruction of the Shrine, Walsingham no longer was a place of public pilgrimage. All devotion was done in secret until after the Catholic Emancipation when public expressions of faith were once again allowed. Charlotte Pearson Boyd purchased the 14th century Slipper Chapel, the last of the wayside chapels en-route to Walsingham, and restored it for Catholic use. Pope Leo XIII by rescript re-established the Slipper Chapel as a Roman Catholic shrine, now known as the National Shrine of Our Lady of Walsingham. The Holy House had been rebuilt at the Church of the Annunciation at King's Lynn. The Guild of Our Lady of Ransom, brought the first public pilgrimage to Walsingham. Visitors to the Slipper Chapel increased in number, and after some time, the devotion and the number of pilgrimages increased. Cardinal Bourne and Bishop Lawrence Youens led the Bishops of England and Wales, together with 10,000 pilgrims to the Slipper Chapel. At this pilgrimage, the Slipper Chapel was declared to be the National Shrine of Our Lady for Roman Catholics in England. American Forces organixeed the first Mass in the Priory grounds since the Reformation. During the war, Walsingham was a restricted zone and closed to visitors, but many service men and women showed interest in the Shrine. The Marist Fathers took over the care of the shrine and, together with the Marist Sisters, are organize the the ministry to the pilgrims. During Pope John Paul II's visit, the Slipper Chapel Statue was taken to Wembley Stadium and was carried around the stadium prior to the Papal Mass preceeded by The Director of the Roman Catholic Shrine and the Administrator of the Anglican Shrine. The Popeasked that the statue be placed on the altar for the Mass. John Paul II decreed that the feast of Our Lady of Walsingham, patroness of England, and in modern times patroness of all English-speaking peoples, would be celebrated on September 24th in England. It is a solemnity for all parishes in any part of the world named for Our Lady under this title. 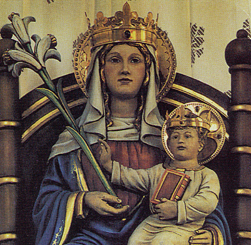 The feast of Our Lady of Walsingham was celebrated for the first time on the new date in 2001. The famous statue of Our Lady of Walsingham depicts Mary as seated, as a dignified queen wearing a simple Saxon-style crown and carrying the Christ-child seated upright on her lap. Mary requested that Richeldis build a replica of the house of Nazareth in Walsingham. To Richeldis, Our Lady said: "Do all this unto my special praise and honor. And all who are in any way distressed or in need, let them seek me here in that little house you have made at Walsingham. To all that seek me there shall be given succor. And there at Walsingham in this little house shall be held in remembrance the great joy of my salutation when Saint Gabriel told me I should through humility become the Mother of God's Son." With papal approval, the Augustinian Canons built a Priory (c 1150). During Pope John Paul II's visit in 1982, the Slipper Chapel Statue was taken to Wembley Stadium and was carried around the stadium prior to the Papal Mass preceeded by The Director of the Roman Catholic Shrine and the Administrator of the Anglican Shrine. The Pope asked that the statue be placed on the altar for the Mass. In 2000, John Paul II decreed that the feast of Our Lady of Walsingham would be celebrated on September 24th in England.